This is a wonderfully relevant teaching given by Rinpoche in Portland, USA in May, and which Ven Roger immediately asked to be made available for us all. It is available in a concise form titled The Real Professional, which I highly recommend to centers to use to bring the Dharma to new students. The full teaching (which of course is even better!) is also available – How to Be a Real Professional. Both can be read and downloaded here. Excerpt: “It’s not sufficient in our life only to know how to do things externally. Whatever our profession is – business or engineering or whatever, being a physician, a doctor, a professional having studied at university, a professional having studied at college how to do things in life, studied how to be a secretary, or how to be a director and run a company or how to be an accountant, all these things, how to clean, how to cook, all these things learnt at school or college or whatever. So what you learn, this profession is only external, how to do things externally. That’s not enough. That’s not sufficient. If you really want happiness, if you’re really looking for peace and happiness, inner happiness, that’s not sufficient. You need to be professional inside. You need to be professional mentally, you need inner professionalism. So a person may have all this education from college, university, how to do this, how to do that, how to be a business person and so forth, but if they are missing the inner profession then what is missing is mentally how to live life, how to do everything. The real profession is missing. That is the positive attitude, living life with this peaceful, happy, healthy mind, non-ignorance, non-anger, non-attachment, and especially with the thought of cherishing others, the ultimate good heart, the thought of cherishing others, unstained by the self-cherishing thought, the selfish mind. Without this inner professionalism, this inner qualification, without this, then what happens? Even if you succeed in the external world, in business or whatever, even though you may be externally successful your mind is not becoming happier and happier, it doesn’t become more and more peaceful, more and more satisfied, more and more fulfilled – that doesn’t happen. There’s more and more problems, more and more unhappiness. The previous films were Seven Years in Tibet, and one (title forgotten!) about people masquerading as priests and escaping… Rinpoche also watched Pretty Woman – backwards! Rinpoche at the time had not met Richard Gere (who stars in the film), and students had been talking about Richard Gere, saying he was a Dharma student and wanted to show Rinpoche the movie, but when they put in the video it was at end of the movie so Rinpoche said let’s watch it backwards – so they did! “The problem is so vast and the urgency so great that the advice which suggests you turn off the tap while brushing your teeth or switch off lights and standbys when they are not needed, or go vegetarian for one day a week seems, well, ridiculous. Global warming is probably the greatest threat our species has ever faced. The sheer scale of the processes under way in the atmosphere and the oceans make it hard not to view anything an individual does to reduce emissions as being too little too late. The astonishing fact is that each of us can have an immediate impact on the production of greenhouse gases, and if enough of us act together in these minor ways, the cumulative effect will be dramatic. That’s because so much of the way we live our lives is wasteful and, to put it bluntly, thoughtless. It takes nothing to switch off a lamp, unplug the phone charger, take a shorter shower, cook without preheating the oven, skip the pre-wash part of the dishwasher cycle, or, often, walk or bike instead of drive. And they all save money, which is one of the rather striking things about reducing your ecological footprint – the standard way of measuring the CO2 emissions each person is responsible for. first rejoice that you have so many different ways to choose from, as well as the opportunity to maybe one day do them all. then, the practice, followed by dedication to all the sentient beings whose suffering has been reduced by the action. Excerpt from this brief and very helpful advice, available to read or download in full from here. I am experiencing this problem, this sickness, on behalf of others. I am experiencing this problem because I have created the cause. I am finishing the karma that I have created so I will not experience suffering in the future. This experience is helping me to practice Dharma. These are the blessings of the Guru helping me to purify. I am purifying. This is like doing Vajrasattva retreat or hundreds of thousands of prostrations. Besides that, this is helping me to meditate on bodhicitta and emptiness. It is like doing the preliminary practices. This practice is done for others, so I accumulate numberless merits because others are numberless. With emptiness and bodhicitta the practice is very powerful. I accumulate even more merits than doing the preliminary practices because the practice is done for others. Also think: This problem is the best medicine. This problem, which is used to develop bodhicitta (by thinking that it is being experienced for others) and emptiness, is the best medicine. This is because you finish with the sickness and also with its causes, which are karma and delusions. Also: This problem is making me develop compassion; thus I can achieve enlightenment very quickly because I am accumulating infinite merits. Today many people are dying, even people without cancer, without AIDS, many very healthy people. So even without cancer the time of death can come at any moment. So it is necessary to purify and accumulate merits. During a recent animal liberation (the Sangha in Rinpoche’s house in California offer an animal liberation three times each month on behalf of any of Rinpoche’s students who are sick), after the Sangha and students finished the animal liberation at 5pm we left the 400 worms in the buckets, as Rinpoche often wants to do further circumambulations and prayers for the little worms himself. So at 9pm Rinpoche came down and spent a few hours circumambulating the stupa at his house. 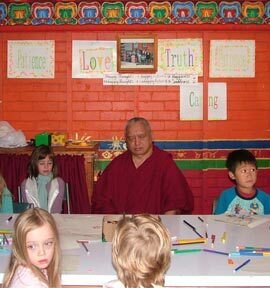 Rinpoche had found a broom to be able to carry both buckets with all the worms inside at the same time. 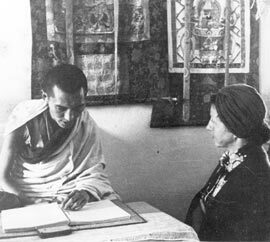 “When I make letterheads for centers, monasteries and so forth, it all has great significance – based on the two truths, wisdom and method, rupakaya and dharmakaya. The reason why I make jewels in the logos is for wealth, prosperity for the centers. Without money, one cannot do anything. 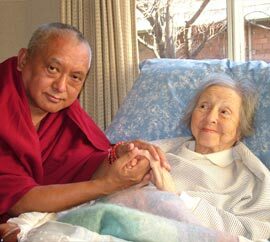 Money along with compassion and wisdom can benefit sentient beings. NB: centers or study groups thinking about their logos can have a look at Logo Guidelines and logos designed by Rinpoche in the FPMT Affiliates Area.